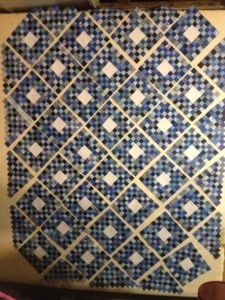 I’m making progress on my scrappy blue quilt. All that’s left to make is the 4 corner units, then it will be time for assembling the rows!! Yea!! Whenever I hear the words 4 corners, it takes me back to the time that we visited the 4 corners. It was pretty cool being in 4 states at the same time!! Colorado, New Mexico, Arizona and Utah. It’s the only place the US where 4 states come together. 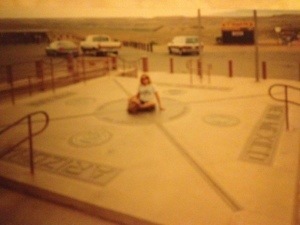 The four corners monument is located out in the middle of nowhere. We were on our way to the Grand Canyon when we stopped there. It was worth stopping by, but once you’ve been there, there’s no reason to go again. Anyway, that’s what brings me to my story about the 4 corners. I’ve been there twice!! My sister collects shot glasses. she has them from several countries and states……. So when I went to the 4 corners “the first time” I got her a shot glass to add to her collection. One day she was home alone, and she suddenly hears a loud crash! It took her a while to figure out what it was. Anyway, it was the shelves that held all her shot glasses!! After inspecting the glasses, they were all fine except one. Guess which one was broke?? If you said the 4 corner one, you’re right!! Lucky for her, we were close to the 4 corners a few years later and I was able to replace the broken shot glass. I told her that if this one gets broke, she’ll have to replace it herself, because I don’t plan to go back again!! Isn’t it funny how something totally not related can spark a memory?